Happy 2019! I hope it's a great year for you. I recently fired up 7 Days to Die again and gave your newest version a spin. I gotta' say it has come a LONG way from the days of Alpha 11 where I came in. I do, however, have some serious feedback that I would like to give regarding your latest version of the game, and, indeed, the direction the game is going in as a whole. I hope you understand that I wouldn't bother writing an essay like this if I didn't care. I have a lot of fond memories of this game and I hope that by providing this feedback I can help you guys make it even better. When you nerf one option, you effectively provide a bonus to another. So, for example, when you make it so players can't effectively hide from the hordes, what you are essentially saying to them is: "The choice you made is not intended gameplay. Even if you try you will fail." I feel that message - subtly directing the player towards a particular style of play through mechanics - is at odds with the spirit of the open-world sandbox survival game that you have created, because it eliminates the most important thing gamers look for in these type of games: player-choice. When players find an exploit that allows them to lure zombies to fall to their deaths, and you change the mechanics so that is no longer possible, you are telling the player: "Your choice in dealing with situation is not the one we would like you to take." You are, in effect, removing one choice players had. I would rather enjoy a game that either A) Gave me full choice for any of those strategies to succeed, or B) specifically put me in the situation where I could focus on enjoying the intended experience. As a player I'm NOT interested in playing a game that presents me with a huge array of options, only to waste my time as I discover that most are useless. So, let's briefly look at strategies players have used to deal with the 7th-day Horde and talk about how those strategies were systematically torpedoed - how the amount choices in dealing with the bloodmoon horde has been made smaller and smaller. - Using walls of storage boxes that zombies can't target as barricades. Since the zombies can't target or damage them, there was no way for them to penetrate the defense. It was later changed that zombies would target these and break through. The developers were saying here "Using this strategy is not how we intend for you to play the game," so they fixed it. And this is one of the few places where I agree with that choice. Moving on. - Using large pits to lure the zombies to their deaths, even as they were attempting to avoid falling in. A deep enough pit would cause a horde to bunch up on the ledge, and eventually they would slip and fall to their deaths. It was later changed that zombies could not be killed by a single fall. So using pits AT ALL is either non-viable or requires special 3-tiered pits which make no sense, except in terms of the mechanics that were intended to eliminate pit traps entirely. 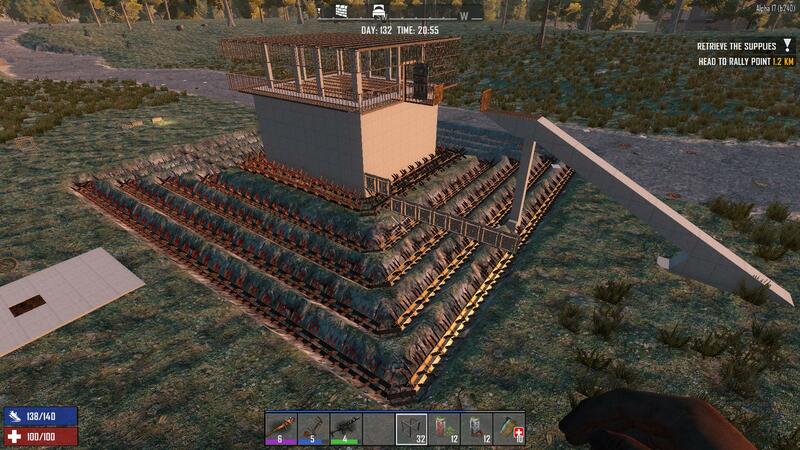 The developers are sending the message "Pit traps are not the solution for the 7-day Horde." - Using bases on stilts in the middle of lakes to avoid the hordes. Since the hordes were slow and couldn't reach the player the zeds would sit in the lake and do nothing. This was later changed to where the zeds would attack things around them, thus endangering the stilts upon which the base sits. So, now zeds can track people from underwater and can break through concrete because this strategy by some players didn't sit well with the developers. The developers though the players shouldn't be doing that, so they changed the game mechanics. - Using walls, spikes and traps to lure zombies into a maze of traps. This abused the zeds pathing mechanics and would lure them into run through a gauntlet of tower-defense like traps, thus obliterating them through little effort of the player. However, the zeds are now aware of such traps (whether it makes sense or not) and will simply tunnel directly through any standing walls to reach the player directly. So, in reponse to player using traps to deal with zombies, the developers just made them super aware, able to know where traps are without any ability to see them, and able to know the most direct route through your base to get to you, and they are able to smash through walls easily. And again, this was done because the developers didn't like that players could invent base defenses which would trivialize their hordes. - Using a raised platform, spikes and traps to lure zombies into a maze of traps. This works like the previous method except that instead of separating the maze with walls, it uses falls instead. However, zeds have been altered so that if they fall off the path, they will attack the stilts upon which the platform sits, thusly defeating the defense. This is basically the result of an arms race between players and developers. Players took the previous idea and modified it, and the developers - again - have shown that they're not interested in players using those strategies so they've implemented even further abilities for the zombies to counter it. Specifically, our all-aware zombies don't immediately path back towards the player (despite clearly knowing there they are), instead they will flail along on the ground for some time, hoping to knock out any support structures the player might have. The zombies do this only because it is a measure taken to remove this type of play from the game, and for no other logical reason. - Using a very high vertical tower to avoid detection and attacks from the zombies. This was nerfed because now the zombies, upon arriving at the base of the player's location, will attack anything, including the base of the tower, eventually leading to its destruction. Again, the developers didn't want their players to be able to hide, even if they went beyond the range of the zombie's massive detection abilities. There are still methods to overcome this behavior from the zeds however, but the developers are telling the players here, concretely, we don't want you hiding from the zombies. - Using an underground bunker to hide from the zombie hordes. Rather than face a horde, players would simply tunnel deep underground and wait them out. Now, however, hordes not only automatically detect players underground but also can tunnel through solid rock straight to their locations. Again, super-aware, super-strong, rock-crunching mobs for the win here. The developers don't want you to hide, so they create this behavior, whether it makes sense or not. - Using a vehicle to ride throughout the horde event as to avoid any zombies. By staying mobile through the horde the player avoids conflict with any zombies and thus can indefinitely avoid confrontation. No counter to this method has been introduced yet. My guess is that the developers don't want this as intended play either, but I also guess it'll take them some time to devise a method to defeat this. Maybe some kind of EMP that can turn off vehicles, or an enemy who specifically targets and destroys vehicles. - Using heavy weaponry, mostly guns with high damage, high rate of fire and accuracy, to dispatch the zombies in a straight up fight. No counter to this method has been introduced yet. Notice that no zombie-behavior has been introduced to specifically counter this. Being able to smash blocks fast doesn't impact the zombies melee damage against a player at all. Being hyper-aware is irrelevant here because the player wants to find and confront the zombies. Zombies attacking terrain at random here plays to the player's advantage in this case as well, serving to slow the zombies down. Everything the player has WORKS in this situation. Unlike previously where zombies avoid traps, demolish concrete walls, and have super perception (which guts half of the things players can make), guns do full damage, power-ups provide valuable boosts, armor prevents damage very well and first aid restores health very fast. It is clear that this is what the developers are trying to push their players to do. So, as you can see, out of all the options that the player had to deal with the situation, the developers have been systematically disarming each until their desired game-play was the most optimal. My question is: why present the player with an infinite array of options to deal with this situation and then take all but one of them away? What this does is: it means that instead of the player being rewarded for creatively dealing with a situation, they are rewarded for following the developers style of intended play, and this is inherently at odds with a sandbox type experience like 7D2D. Why offer all the varied block manipulation, traps and building materials if only a tiny few are useful, given the zombies bizarre range of powers? The game is clearly directing the player towards one style of play. But having one style of intended play isn't bad at all - it's rather that the game can't decide if it wants to be an open-world sandbox or an concise gameplay experience. For example, if I want a polished, good, high paced game of shooting waves of zombies that charge at me while I use my weapons, be it guns, nailguns, shotguns, melee weapons, etc., to fend them off, I'll play Killing Floor 2. That game succeeds brilliantly because it focuses on doing one thing, and doing that thing very well. In KF2 I don't have the option of building useless traps that the zeds will path around, or waste time on pits that will never kill them, even if they do fall in. KF2 doesn't waste my time with options that its developers have intentionally sabotaged. 7D2D on the other hand presents the player with a massive array of options in dealing with their predicament, but then undercuts that by systematically nerfing or removing them until only a certain kind of gameplay is left - disregarding what the player wanted as their experience. To the developers, I would say, you should embrace the myriad of ways that players want to deal with the zombies. Players should be able to choose if they want to kill zombies with traps, if they want to kill zombies with fall damage, if they want to evade zombies by hiding, or evade zombies with decoys, or evade zombies with vehicles. They should be able to spend the horde nights running zombies over in blade-outfitted vehicles, or hiding at the top of a whether mast while the zombies below search in vain. They should be able to barricade a house so the zombies have to come through their trap laden front room, or build a concrete obstacle course that has the zombies running through it like a tower-defense style maze. Developers, in a sandbox game, it is the player who decides the optimal way to play, not you. You can introduce things for them to mess with, but, ultimately, what they do with those things is up to them. If anything, the developers should make sure that each of the strategies works, and add even more. Maybe you could tame a dog to lure zombies into traps? Or maybe fun physics related traps to fling enemies into pits. Embrace the variety of crazy and creative strategies your players have for dealing with the situation - don't suppress them. Or, on the flip side, if the developers DO have a specific experience in mind for their gamers, they should focus on that. Don't let players dig underground if you don't want them hiding out the hordes underground. Don't let the players build such high structures if you don't want them to go so high. Don't let the player build so-called 'reinforced' walls if the zombies are going to tear them down with ease. Don't allow your player to build pit traps if fall damage isn't a viable way to kill their principle enemy. In short, either deliver a concise, directed experience, or allow the player the freedom to play the game in the way they choose. If a player chooses to use a strategy that makes zombie corpses fall at their feet where they can loot with ease, that's okay - that's a player reaping the rewards for a well-executed strategy. If a player spends every 7th day cooped up in their bunker, completely sealed in, that's okay - that's a player who has chosen that path and can deal with the consequences. If a player spends their 7th night in an intense run and gun battle with an enemy horde, that's okay - that player had plenty of options to do other stuff but chose the one they enjoyed the most. When you nerf to one strategy, it's like giving a bonus to another. When you continually nerf and remove player's choices you are ultimately telling them "There IS a 'right' way to play this game," which, for a sandbox game like this, is really a shame. Last edited by firstedition; 01-12-2019 at 09:36 PM. Thanks for your feedback. I think as time goes on the easy exploits that have been found regarding the new AI will be closed and a new variety of building options will be discovered by the players. Already we are seeing builds being reported by players that other players initially stated were impossible. Some players are leaders and love to experiment and discover the secrets and other players need those players to post their findings so they can have fun too. Adaptation will result in many varieties of ways to defend against the enemies that want to kill you. What the developers don't want are methods that are too easy or don't require effort. It's not that they took your list of building strategies and threw darts at them. It is that they looked at general behaviors of zombies and decided what they wanted and what they didn't want. They don't want zombies running in a loop so they will seek to fix situations that result in a loop. They don't want zombies standing around or spinning in circles if they can't reach you. So they talked about it and felt that zombie going berserk and laying waste to nearby blocks was something that seemed fitting and would avoid the situation they didn't want. They don't want zombies partitioned away from the underworld so they gave them the ability to dig. They don't want zombies to be stopped by simple gaps so they gave them the ability to jump. See? It's all about the zombie behavior they do and don't want. They are not directly trying to kill player options. What they hope is that players will rise to the challenge that the new behaviors create and come up with creative ways to defend. They don't want players to say, "I guess TFP doesn't want me to play underground." They do want players to say, "Wow, I wonder how I can be successful underground given the new abilities." Last edited by Roland; 01-12-2019 at 07:22 AM. After having read this I have to agree. I still really enjoy the game but it does seem like everything players come up with gets nerfed. The worst part is I don't see the intended path. I know the ai is in the very early stages so I'm kinda just waiting it out and see what they got in mind. The AI avoiding traps though is a game killer. Latest and best traps I've been using is barbed wire on the side of the wall as it lasts mich longer that way but that is an exploit that will surely be patched soon leaving barbed wire useless once again. It takes but a few seconds for them to destroy it on the ground and this is only one example. I'm definately running out of ideas other than ramping it or sitting on a poi. Again, I really enjoy 7DTD. Love the new look, new houses and mods etc. The game has a lot more cool toys now which I am enjoying but the points you made are pretty spot on and good food for thought. So, as you can see, out of all the options that the player had to deal with the situation, the developers have been systematically disarming each until their desired game-play was the most optimal. My question is: why present the player with an infinite array of options to deal with this situation and then take all but one of them away? What this does is: it means that instead of the player being rewarded for creatively dealing with a situation, they are rewarded for following the developers style of intended play, and this is inherently at odds with a sandbox type experience like 7D2D. I couldn't agree more with OP's sentiments. They clearly don't want you to even bother with crafting until you've played 60-plus levels of 7 Days to Hunt Zombies. Yeah - the game is now about US hunting THEM. The sheer amount of immersion and variety that has been yanked since a16 is unbelievable. A good sandbox game should receive more options and variety as development advances, not less. The advance-by-doing skill system that could be supplemented with perks to achieve balance? Replaced with something that pushes every character to be exactly the same. Crafting? Sure, you can get semi-serious about it around level 60 (??! ), but by that point you won't even care because a hole in the ground is as good as a concrete fort now. Making ammunition, vehicles and steel tools are the new endgame. Dumb but strong zombies? Replaced with psychic killers who can rapidly destroy anything no matter how durable. Improved but not overpowered mobility courtesy of a minibike? You can build a jeep now and carry it in your pocket. I guess being able to carry a vehicle was necessary since the devs seem incapable of fixing the disappearing minibike bug. And I won't even get into the gyrocopter. I'm not saying that a17 is all bad. The insanely punishing and illogical weather system has been toned WAY down. Same goes for thirst and hunger. Some of the recipes are now more sensible. The variety of new POIs, some of them very cleverly designed, injects a lot of life into the world. Some aspects of the UI have been polished and refined. But most of the other changes are either a really mixed bag or completely negative. Yes, removing durability from clothing does away with a significant headache but also an entire aspect of immersion, and clothes are extremely rare now. Graphics are greatly upgraded but the performance is horrible and trees look like cotton candy until you're close enough to hit them with a rock. Zombies don't have any loot on them unless they drop a rare bag that can contain almost anything. Uh, whut? They used to have loot on them that made sense, like a cowboy hat on a cowboy-looking zombie! Feral zombies, including radiated ones, can be found almost anywhere and at any time from about day 20 onward. This makes no sense at all - those were clearly meant to be later-game mobs. Oh, and then you have the magical collapsing structures that insta-kill you and destroy all the loot in a building. Really, Fun Pimps, do you despise your players that much? Or do you just feel the need for even more negative reviews? Its illogical, vindictive, unrealistic and not at all fun. Let's not forget the buzzards, either, i.e. the murder drones that aggro the moment you see them and follow until either you or they are dead (or till you teleport away, which is what most people will do). FFS, you can't even pick flowers anymore - you have to punch them. Were the devs scared of confusing the Minecraft fans with too much realism? And of course we can't forget about leveling, which is now all about killing zombies. Supposedly this is addressed somewhat in the latest experimental but seeing as how I can't find a single sever running it its clear that nobody cares. Hell, there are more a16 servers than a17 unstable ones. I just don't get why the developers would take away things that made sense and replace them with illogical tedium. This is all fixable, and probably without a huge amount of work since its mostly minor tweaks and putting things back in that were removed. Keep the bugfixes and new content but give us back the depth of gameplay and sense of accomplishment. Last edited by psycros; 01-14-2019 at 04:07 AM. I know that everyone likes to think of themselves as the center of someone’s world but I’m sorry to say that the developers are not out to get you, act vindictively against you, or to punish you. I remember when spider zombies and hornets were added to the game. For a time there were similar posts from people complaining that base building was impossible until some figured out how to do it and then more figured out other ways to do it. We are already at the beginning of that transition with more and more people posting base designs that work. Some exploit behaviors of the zombies that the devs don’t want the zombies to do so those strategies eventually won’t work but others will as players discover them. As for vultures, you can ignore them. Until your health drops below 90% they just circle passively. I had four of them circling above me last night. I just ignored them and was extra careful to not get hurt. I don't belong to that crowd lol. I used to run a heavily modded Battlefield server, I have had the pleasure of finding out how hard game balance is and I'm sure my experience doesn't come close to what it must take to create a balanced and fun game from nothing. I am certain the devs want the game to be fun and are doing their best to please everyone, sometimes too much if you ask me. I just like to throw feedback out where I can so that the devs see how their game works for different types of players. After having read this I have to agree. I still really enjoy the game but it does seem like everything players come up with gets nerfed. That's not exactly true if you look at the kind of "tactics" listed. If storage boxes are completely invulnerable to zombies then that is a simple bug. If a pit kills every zombie with zero maintenance then it should be pretty easy to see why that needs to be fixed. Every other means of zombie killing requires some degree of constant effort, supplies or maintenance. See the problem now? I can see why players would glorify exploits but that doesn't make those good gameplay. By and large the OP listed a bunch of bugs and exploits that got fixed. So... you're welcome. The moral I'm getting from this thread is that when you find a tactic that works, that you consider to be clever but others might call an 'exploit', don't get all excited and stick videos of it on Youtube and start boasting about it. Just quietly use it, and the devs don't know it exists, they won't neutralise it. The killing pit (fall damage) could been kept fully working, some would've used it, others would not. And some would discover it for the first time on their own, and be thrilled over they discovery. Sooner or later, they'd probaly grow bored of it, and try another trick, of which there been many. And where as a killing pit can have little to zero maintenance, it did take quite a while to make. moved onto to other strats. and creativity, might soon be better off looking for other games. Yeah I agree about the loot box exploit, that was broken. Thing is there has to be a point where we can eventually win. Right now I'm not too sure how to do that without some kind of "exploit". I'm not the kind who likes to use exploits, I used toothy because it didn't seem like an exploit. It was believable because zombies are dumb by definition so I didn't see it as an exploit. Thing is that build had gameplay and is a good example. You would be safe at first but as cops and ferals start showing up you wont be able to keep up with repairs. You needed a backup plan to get on top of it or under it before they break in. This is a good example of how I think a horde night should work. They made me struggle and had me planning escapes but I was able to win if I had my upgrades to steel and killed them fast enough. It made having cement and steel worth it, now they just melt things in under two minutes and it's gg if you don't loop them. So although toothy wasn't nerfed directly, it is now no longer an option nor is any other build that is made to tank a bit and enable melee/looting. Building underground isn't what it was either. Building anything but a ramp seems to be asking for trouble. Would that ramp thing not work I believe there would be a lot more complaining on the forums. Just a reminder, I know the ai is far from finished so I'm not judging it as is but rather giving you guys feedback on how the game feels now. I will just address this one and say that open world sandbox games do NOT mean you can IGNORE or SKIP the core rules of the world. One of core rules is resource investment or active participation in 7 day hordes. Its as core and as mandatory as hitting things to get resources, needing crafting station to craft advanced items, drinking and eating to keep yourself alife and getting exp to unlock new stuff. Skipping any single thing of these is NOT a "sandbox player choice", its a cheat, exploit, hack. If you don't want to participate in the horde and be safe, then build yourself enough traps to passively kill the Zs, exploiting AI to be 100% safe at all times is not "player choice", if you want it to be like that, then disable zombie spawns. Using unintended exploits is not "player choice", its just that - an exploit, a cheat, an abuse of unintended AI behavior. Yes, cheaging is also a "player choice" and a "playstyle", but don't expect it to never be addressed. Open world sandbox doesn't mean no rules, if you want no rules to apply, play in debug mode with creative menu enabled. If 7 day hordes could be exploited without your direct imput, without any effort, without any material use like in previous alphas, what would be the point to even have them? You effectively cheated before, now you can't, you ignored basic world rule by exploiting, now you can't. Playstyle was NOT removed, a cheat exploit was elliminated. An issue was fixed, not playstyle removed, you like to be a mole, you can still be a mole, just don't expect to be invincible, invulnerable mole. Last edited by Katitof; 01-12-2019 at 12:20 PM. it is now no longer an option nor is any other build that is made to tank a bit and enable melee/looting. If you insist that melee will be your only means of dealing damage in base defense then you are voluntarily putting yourself at a major disadvantage. You are freely giving up any defense in depth and your choice makes the game much harder. There is nothing wrong with that but many will not wish to handicap themselves like that. Week 5 or 6(ish) my base was still pretty safe. Zombies are not using the entrance ramp for any pathing loopery but come straight at the base. Spikes do their spiking, I use ranged weapons and occasionally go out to mingle and melee.